I absolutely love this books. So good! Alanna is one of my favorite characters of all times. Oh yes. Alanna is THE BEST. And she grows so much from the beginning of book one to the end of this one! Alanna rocks my socks off, and this book just shows off her growth so well. She's getting older and there's a ton thrown her way, but she handles it so well. 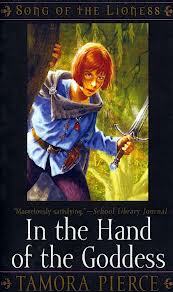 I remember reading this series way back in 9th grade-I am so glad my friend introduced me to Pierce. Looking forward to your reviews of book 3 and 4. Ahhhhahaha. Back when love triangles were still a new thing. But Alanna is still the quintessential feminist protagonist. I need to finish this series!